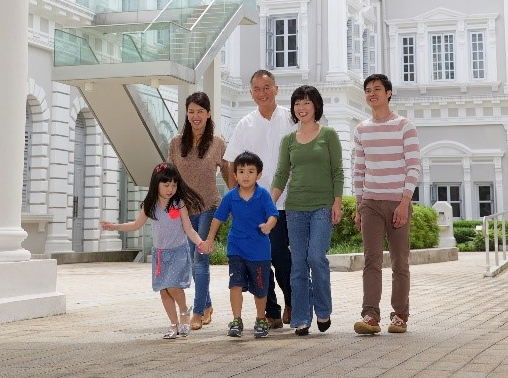 Spend an afternoon at the National Museum with your family and enjoy fun-filled activities suitable for the young and the young at heart, this Grandparent’s Day! Families for Life and the National Museum invite everyone to kick start the festivities on Saturday, 25 November. Be entertained by music performances on the Steinway grand piano, stage games for families, a drawing competition for budding young artists, and even a colouring workshop just for grandparents! Don’t miss the signature Families for Life Mobile Café and bouncy castles. Choose family time and create special fond memories with our grandparents that day! Walk down memory lane with your grandparents as you revisit the milestones of Singapore’s history in the museum’s permanent galleries, and hear first-hand accounts from ordinary men and women whose lives were upheaved by the outbreak of hostilities in Singapore in 1942, in the blockbuster exhibition, Witness to War: Remembering 1942. The exhibition also includes a family activity space, A Child’s Perspective, which offers young visitors a glimpse of what war was like for young people through interactive activities, such as the opportunity to explore a makeshift air-raid shelter. Young visitors can also pick up a copy of the Young Journalist’s Notebook, which will take them on an interactive quest through Witness to War and the two other war-related galleries in the museum. Join us as we revel in the joy grandparents bring to our families, and make them feel extra special at the Celebrating Grandparents’ Day with Families for Life at the National Museum! More information on the programme highlights can be found in the appendix. Families are encouraged to register their interest early on the Families for Life website to receive a complimentary goodie bag, while stocks last. Registered families can surprise their grandparents with a carnation from us! Programme Charge: Free (excluding purchase of food and beverage on location). Admission to all galleries will be free on that day. This event is co-organised with the National Museum of Singapore. To find out more about Families for Life’s series of activities, visit the Families for Life website.